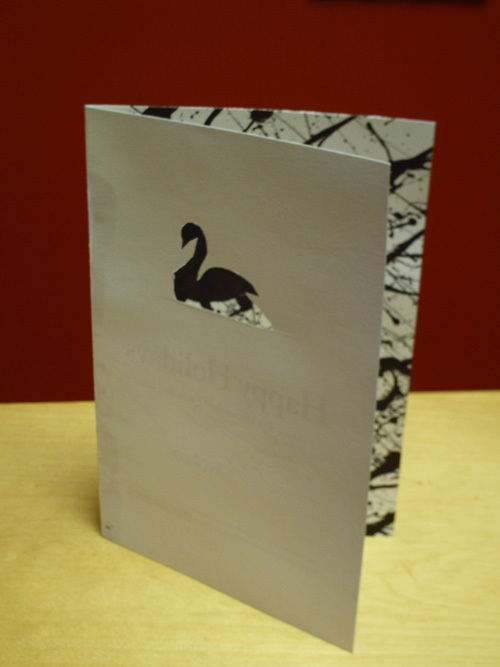 While we were cleaning up the office recently we found a cache of splattery holiday cards we made last Winter. One of the challenges of being a tiny developer is finding cool ways to get our game out there. Especially when we don’t have a game we can talk much about yet. The holidays seemed like a good time to remind people that we were still alive and working and we also wanted to create a cool memento for our game. We painted the cards in batches, which was messy and ruined quite a few cards in each batch. 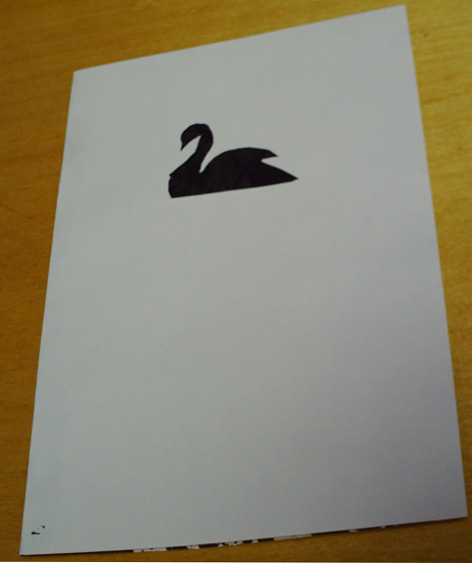 Then we all sat around for a few hours cutting out swans with Xacto knives. Which means each card is a little shoddy, but in their own special way. It took a few attempts to get them right and we wound up with some mutant swan cards, but we did get into the swing of it pretty quickly. We probably spent too much time making these but any time we’re throwing paint around counts as good research. 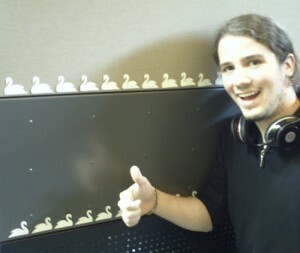 A few late evenings and repeated visits to local craft stores (which are their own special circle of hell during the holidays) seems like a small price to pay for the army of paper swans now decorating our cubicles. Having found these extras nearly mid-way through 2010, it seems kind of silly to keep them around. The holiday season 2009-2010 isn’t getting any closer. But they are well made (if we say so ourselves) and we’d like to share them with you. 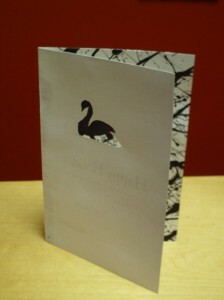 If you want one of these cards just be the 1st, 2nd, 3rd, 5th, 8th, or 11th person to e-mail us with a valid postal address contests@giantsparrow.com and we’ll send you one. The contest is now closed, thanks for mailing in everybody– you’ll get your cards just as soon as the postman drags them off.